When I told people that I was going on a vacation to Iceland they invariably said, “Why Iceland?” The most direct answer was that Jeff, the kids and I had flown through Iceland on the way to Europe on two occasions. Icelandair offers the best prices to points all over Europe. The catch is that you have to go through Reykjavik to get where you “want to go.” We were curious. We wanted to see more than the rugged rocky terrain that we could glimpse from the airport windows. When Icelandair sent me an email about a “Northern Lights” package way back in March, I knew this was our chance. I quickly booked the trip to secure the screaming deal that they were offering and, life having caught up with me, I didn’t think any more about it until we were somewhere over Greenland. I had no idea what to expect. Those that know me well know that I tend to be meticulous in my planning. (Jeff would say “over-meticulous.”) When I am preparing for a big trip, I typically do months of research to educate myself, and my kids, about our upcoming destination. What was there to know about Iceland? I didn’t think that there was any research to be done. There was certainly no time to do it. So I didn’t. I imagined that we were bound for the North Pole. (Isn’t that what you picture when you hear “Iceland?”) Come November, I packed my bag, throwing in a few last minute Iceland guidebooks from the library, and we were off to see the Northern Lights. First let me say, Iceland is misunderstood. It is an island nation born from the divergence of the North American and the Eurasian tectonic plates. It is literally being born, just as the Hawaiian Islands are, growing out of the fissures of the planet. Knowing nothing about it, we assume many things: that it is cold, unlivable, uninteresting, not worthy of our time. First off, the climate is nothing like the North Pole. During our stay in early November, the average temperature in Reykjavik hovered around 32° F. In the northern town of Akureyri, where went to search for the Northern Lights, it was snowing quite heavily but the temperature didn’t dip below 15° F during the two days we were there. In the summer, the highs don’t even touch the 70s, mostly hovering in the mid 50s. The mild weather is a result of the North Atlantic Gulf Stream current. I was glad I packed my long underwear, but I didn’t need anything more than I would on a chilly day in the Northwest. The whole of Iceland falls just south of the Arctic Circle, yielding short winter days and long sun-filled summer days (and nights). During the time that we were there in early November, the sun rose around 9:30 am each day and made its way over the horizon just before 5 pm. This was ideal for the dark skies we needed to see the Aurora Borealis. In the height of summer, the sun stays above the horizon for 21 hours or more. Iceland is not unlivable either. It was settled by Vikings in the year 874 and has been consistently inhabited ever since. In fact, there are 320,000 inhabitants. That is just enough to earn Iceland the distinction of the most sparsely populated country in Europe. To put that into perspective, at 635,000, Seattle has roughly twice the population of the entire country. 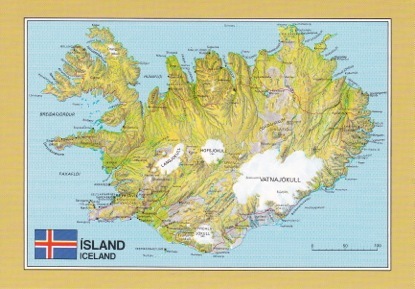 Two-thirds of the population lives in Reykjavik and the surrounding areas in the southwestern region. Ironically, that is also the area where the Vikings first settled. They found a good spot and stuck it out – for 1,100 years. Akureyri, on the northern coast, is the second most populated city in the entire country with around 17,000 people. That’s about the size of Port Angeles. It reminded me a lot of Port Angeles, too (if you replace the Fjord Eyjafjordur with the Strait of Juan de Fuca). When examined more closely, you quickly discover that Iceland is worthy of your time. It is interesting. In actuality, it would require several trips to experience it fully. In the short amount of time that we had to explore, I learned a myriad of interesting things that only left me wanting to come back for more. Iceland is exotic. It is rich in history. It is picturesque. From Seattle, it takes a short 7-hour flight to transport you to another world. A world that I hope to see again soon. Great post! So completely true, especially the bit about Iceland being worth your time. By the time I had I felt like I was leaving home. It’s a place that has found space in my heart and that I will visit again and again.